Learning to ride a motorcycle safely is one of the most exciting things you can ever do. Offering freedom like no other mode of transport and delivering a sense of speed and exhilaration unmatched on the road, we think it's absolutely something that everyone should achieve in their lives. 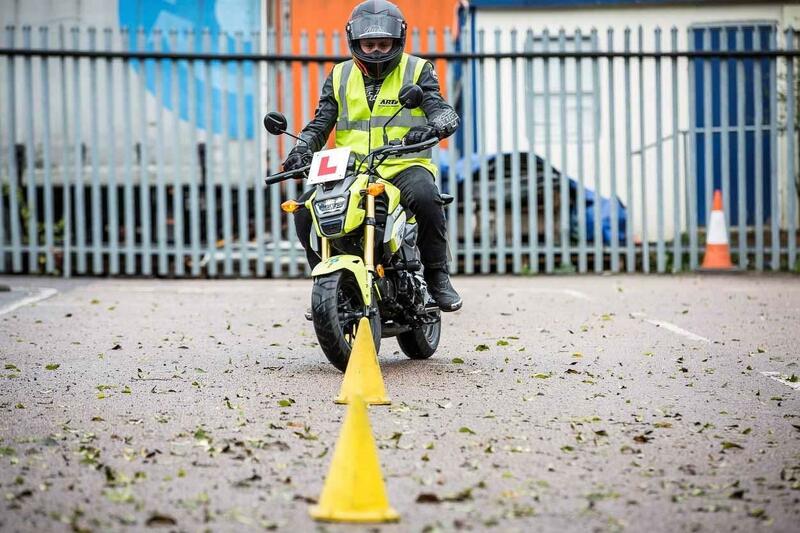 It's a different subject to how to pass your motorbike licence, which deals with the different types of certification for UK riders, and more about precisely how you take control of a motorbike. Unfortunately, not everyone seems to have cottoned on the wonderment of motorcycles and so it remains very much a niche pursuit in Britain, meaning genuinely useful advice on the basics of how to ride is hard to come by outside of paid tuition. Often reliant on parents and grandparents passing on knowledge to the next generation of bikers, it can be hard for those not originally from a motorcycling background to get to grips with the fundamentals of riding. 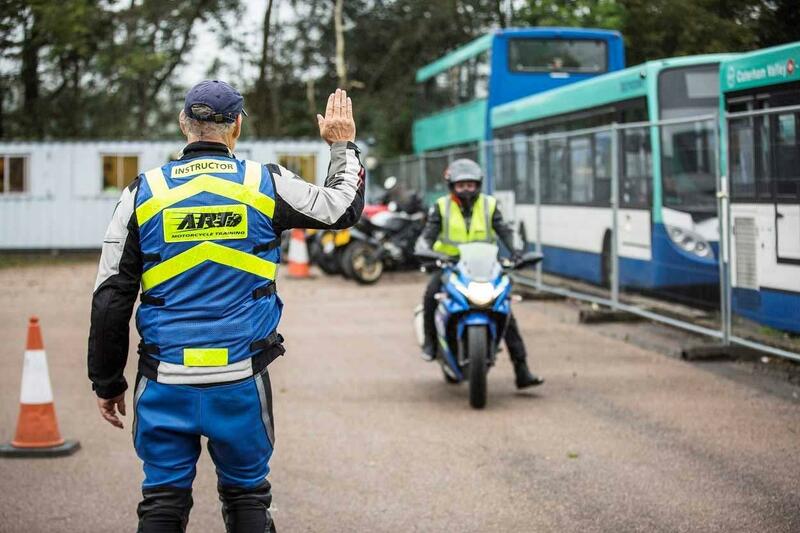 To help those in need, MCN has spoken to vastly experienced motorcycle instructor Steve Manning for some expert advice. Steve runs ART (Advanced Riding Techniques) Motorcycle Training in Crawley. Operating out of multi-franchise dealership P&H Motorcycles and supported by Honda, Ducati and Kawasaki, the school was the first to be officially recognised for training by more than one manufacturer, as well as gain accreditation from the MCIAC (Motorcycle Industry Accreditation Centre) – meaning they go above the required standard of motorcycle education. Below is your handy guide to riding a motorcycle from Steve, taken from his own experiences after decades of instruction. Although it might sound trivial, the first rule of riding a motorcycle is balance. The best way to achieve this is by riding a bicycle and if you cannot do this, then it is imperative that you learn before attempting to ride a motorbike. "To try and learn to ride a powered-two-wheeler without having a fully developed sense of balance would not only be dangerous, but it would be extremely frustrating for the person trying to learn," Steve said. "We have a pushbike at our school and if someone is really struggling to ride, we will go back to that to see what they are capable of. Unfortunately, over the years we have had to send people away and have them return once they are very confident on a bicycle! "Riding a motorcycle should be a fun experience and if someone does not have a good, developed sense of balance, which only comes from riding a bicycle, then it will be no fun at all." The ease of using the clutch on a manual motorcycle (DCT and twist-and-go scooters do not have one) is entirely dependent on a rider’s ability and experience. If you don’t get it the first time then don’t despair, this is one of the hardest parts of learning to ride. Those who have used a manual car will have an advantage over those who only driven automatics, or have no experience of four wheels and if you have never used one, it is all about taking the time to learn and remaining patient whilst you do so. "To pull away on a manual motorcycle you need to feed the clutch out slowly through the left-hand lever," Steve added. "You ease it out until you have made a smooth transition from stationary to moving and should think of the clutch as a dimmer switch, instead of just switching something on or off." By feeding the clutch out slowly, it will allow you to find the 'biting point', which is the moment you start to feel engine want to move the motorcycle forwards. From here, it is all about matching the throttle input as you move the clutch lever further out. Too much or too little of each could cause the bike to stall, or surge forwards unexpectedly. Remember to pull the clutch in again when coming to a stop, or the motorcycle will stall. How do I change gear on a manual motorcycle? Once you have mastered how to pull away and stop, the next stage is the gears. For this, the ART team use a simple five-point-system, with the idea being that once mastered, with sufficient practice, it simply becomes an intuitive action - much the same as it would in a car. "Again, this is dependent on your ability and experience," Steve added. "The throttle is usually very sensitive and will respond better to kind applications. 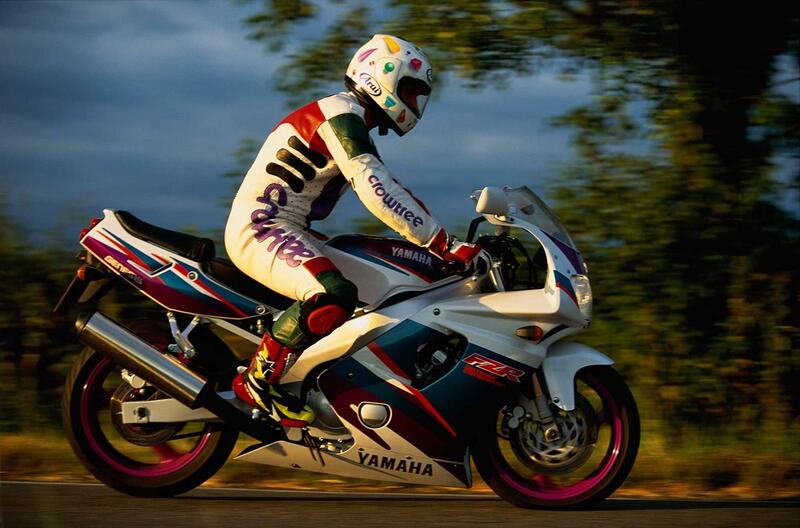 "If you are harsh with the operation of the throttle, then the bike will tend to accelerate very quickly. 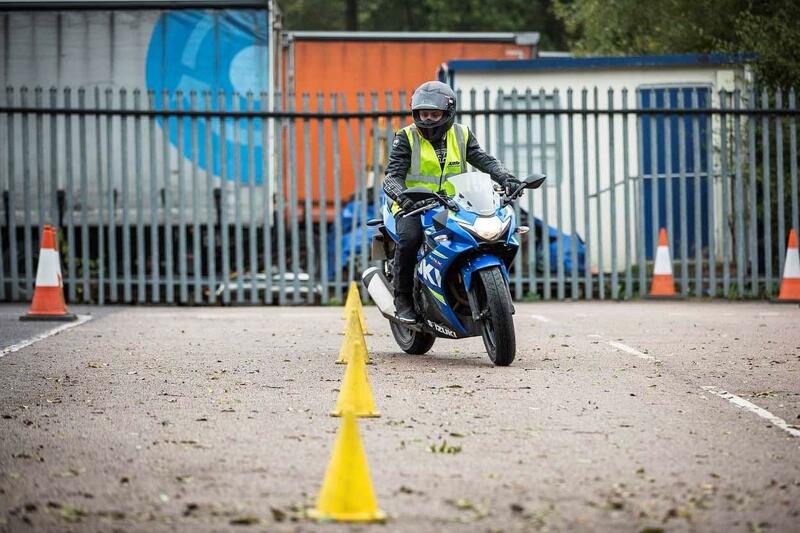 This, combined with 'dumping' the clutch will make the bike take off very fast, usually scaring the rider - not to mention giving the instructor heart palpations as well!" 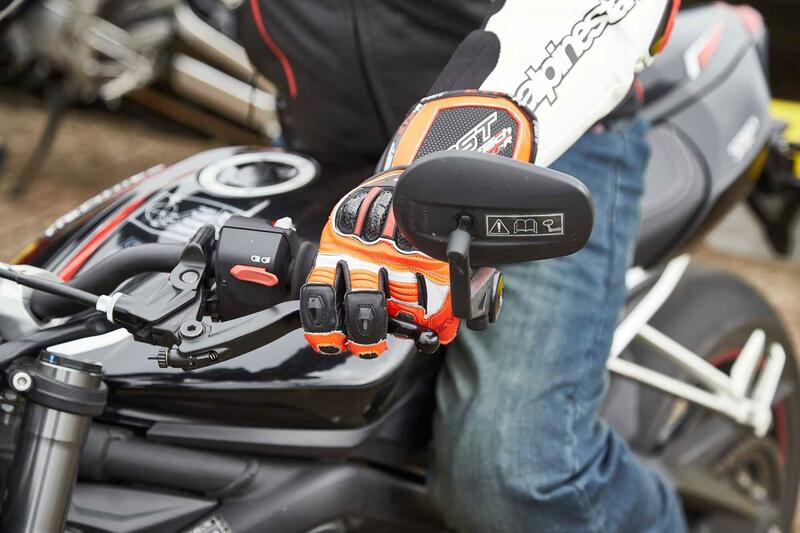 Alongside throttle application, a light grip is also required by new riders, with Steve saying: "As a final piece of advice, it’s also worth mentioning that if a rider is nervous or apprehensive, they can grip the throttle too tightly. This can then make the bike rev higher than they need." Unlike a car, the brakes on your motorcycle are often not both controlled by one lever. Instead, the front brake can be applied with your right hand and the rear is operated by your right foot. According to Steve Manning, this is one of the most commonly asked questions of new riders and he offers the following advice: "The front brake is the most powerful brake on the bike and is great for taking off lots of speed or bringing the machine to a complete stop in a hurry. "However, it’s also way too powerful for use when attempting to ride slowly and the most common accident we see is misuse of the front brake whilst attempting to corner or lean the bike," he said. Steve then went on to add: "At slow speed, with the bike doing less than 10mph, the back brake should always be used to slow the bike down before attempting to stop. "We also actively encourage learners to never cover the front brake unless you know you are going to do something with it. This is because if you cover it and then panic, you will grab it. "This is bad if you’re going round a corner, attempting a U-turn, slalom, figure of 8 and so on, as the outcome will always result in a very sudden loss of control (and occasionally a low-side crash)." When learning to ride, it can be tempting to dangle your feet at all times as a form of safety net, however by doing this you could actually be putting yourself at unnecessary risk. 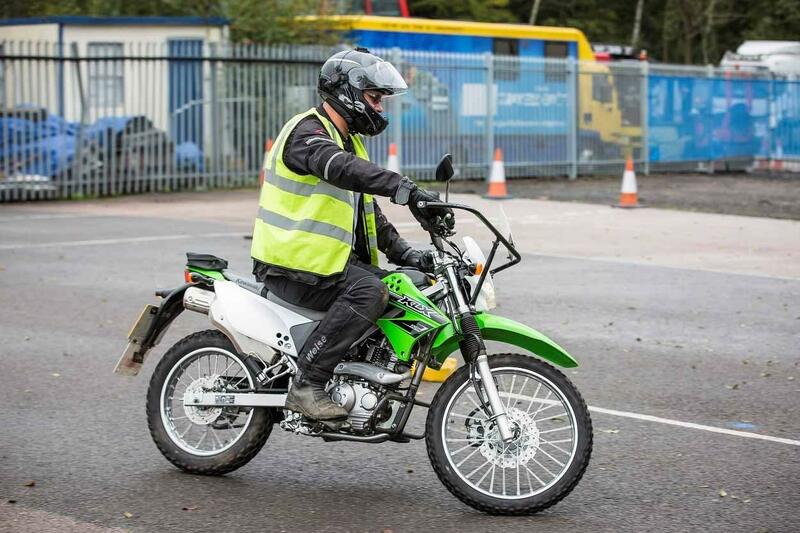 To combat this bad habit, Steve says: "Considering we need to use both brakes when brining a bike to a safe, controlled stop, the left foot should always be placed on the floor first, as the rear brake is almost always on the right hand side of the machine. "Even when we are teaching scooter riders to stop, we encourage left foot down and there are two reasons for this. Firstly, if they ever want to ride a motorcycle, it will prepare them for the position of the rear brake. "Secondly, if your legs are positioned pavement-side, there is less chance of being run over by other traffic when stationary." The most important message here is to look where you want to go. Put simply, if you do not look around the bend you are tackling, chances are you will not make it around the bend. 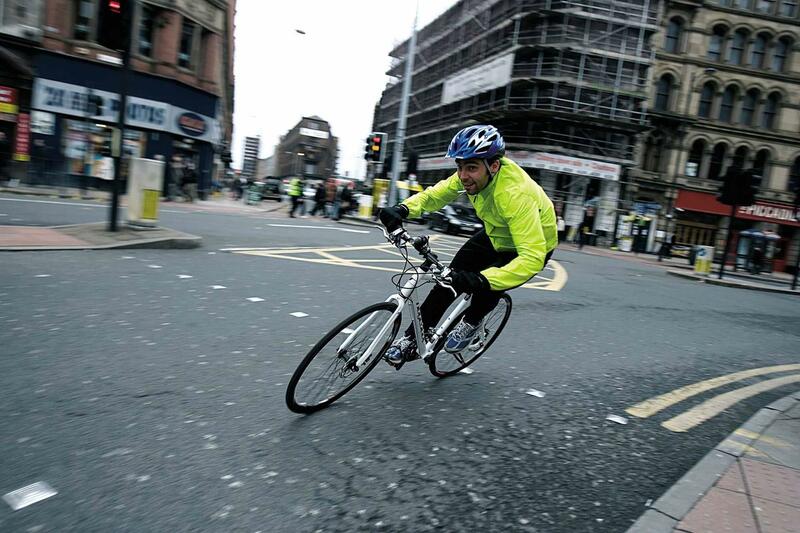 "Whilst riding slowly, attempting a U-turn, slalom, or figure of eight it is important to keep your vision up. Make sure you do not look at the floor or the bike," Steve said. "When teaching this to pupils, we tend to use the phrase, 'vision on full beam, not dipped'." Do they offer one-to-one lessons so you can learn at your own pace? Finally do have fun, it’s one of the best things you will ever do!